Expert advice on how to test for mold, with advice on toxic household mold removal, removing mildew from wood and framing, and mold prevention and control tips. An environmental problem wherever excess moisture exists—such as in the aftermath of floods or in very damp climates—is mold and the health problems it can cause. 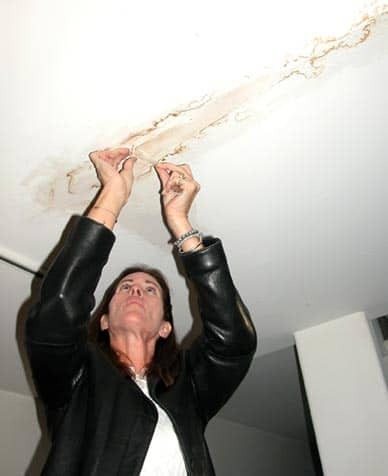 Water stains on ceiling are tested for mold before repair and painting. Allergic reactions to touching molds or breathing mold spores include runny nose, red eyes, sneezing, and dermatitis (skin rash). In addition, people with asthma may be more prone to attacks when exposed to mold. Worse, toxic mycotoxins can be produced in concentrated forms by some molds like black mold, particularly in especially damp indoor areas. These can be carcinogenic or cause central nervous system damage. Molds are natural organisms that grow on organic materials and are fed by moisture. Outdoors, they are as much a part of nature as the trees. Mold spores too tiny to be seen drift in the air, landing on fallen leaves, soggy ground, and dead trees, where they set up little colonies. Molds thrive in a damp environment, growing and reproducing. Fortunately, most outdoor molds don’t present health problems to humans because they are not encountered in concentrated amounts. 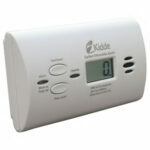 But indoors molds can grow and become more concentrated in the ambient air. Even in houses that haven’t experienced hurricanes, flooding, and the like, molds flourish in moist, warm, insufficiently ventilated places such as crawlspaces, showers, leaky attics, and areas behind refrigerators. Plumbing leaks, sprinkler water, and flooded sewers are other sources of dampness that encourage mold growth. According to the Environmental Protection Agency (EPA), symptoms other than allergic or irritant types are not commonly reported as a result of inhaling mold. Nevertheless, if you have health concerns about symptoms that may be caused by exposure in your home, the EPA recommends calling your local or state health department. Do this before cleaning up the problem so that tests may be taken if necessary. In most cases, if visible mold growth is present, sampling is not needed. And since no EPA or other federal limits have been set for mold or mold spores, sampling cannot be used to check a structure’s compliance with any federal mold standards. Surface sampling may be useful to determine if an area has been adequately cleaned or remediated. In order to limit your exposure to airborne mold during mold cleanup or removal, wear an N-95 respirator, available at many hardware stores (they cost between $12 and $25). Some N-95 respirators resemble a paper dust mask with a nozzle on the front; others are made primarily of plastic or rubber and have removable cartridges that trap most of the mold spores from entering. 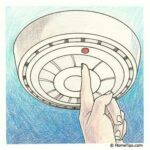 In order to be effective, the respirator or mask must fit properly, so carefully follow the instructions that come with it. When working with water and a mild detergent, ordinary household rubber gloves are sufficient. If you are using a disinfectant, a biocide such as chlorine bleach, or a strong cleaning solution, select long gloves that extend to the middle of the forearm and are made from natural rubber, neoprene, nitrile, polyurethane, or PVC. Avoid touching mold or moldy items with your bare hands. Wear goggles that do not have ventilation holes to prevent mold or mold spores from getting in your eyes. Though you can’t completely eliminate mold from your home, you can—and should—reduce and control it. Removing known patches of mold is an important first step. Then you must remedy the source of moisture. Without moisture, mold cannot grow. Small patches of mold can be cleaned up by do-it-yourselfers with detergent and water; areas larger than about 10 square feet or where there has been extensive water damage are best left to professionals. The use of a chemical or biocide (chlorine bleach, for example) that kills organisms such as mold is not recommended as a routine practice. There may be instances, such as when immune-compromised individuals are in residence, when professional judgment may indicate the use of a biocide. 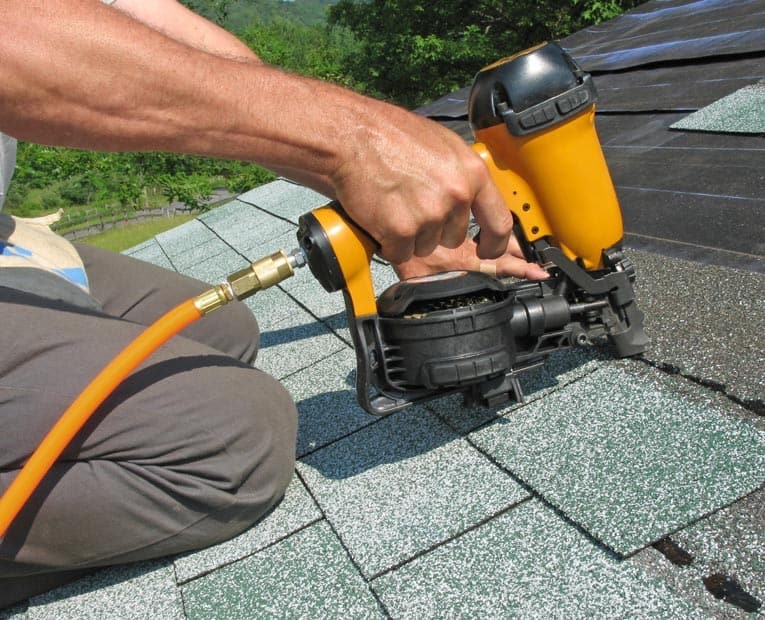 If you choose to use a biocide, always ventilate the area and exhaust the air to the outdoors. Never mix a chlorine bleach solution with other cleaning solutions or detergents that contain ammonia because toxic fumes can be produced. If you choose to hire a professional to do the cleanup, make sure the mold removal contractor has experience cleaning up mold. Check references and ask the contractor to follow the recommendations in the EPA’s guide “Mold Remediation in Schools and Commercial Buildings” or the guidelines set out by the American Conference of Governmental Industrial Hygienists (ACGIH). If you suspect that the heating/ventilation/air-conditioning (HVAC) system may be contaminated with mold (it is part of an identified moisture problem, for instance, or there is mold near the intake to the system), consult the EPA’s guide “Should You Have the Air Ducts in Your Home Cleaned?” before taking any action. Do not run the HVAC system if you know or suspect that it is contaminated with mold as this could spread the mold throughout your home. If the mold was caused by sewage or other contaminated water, call in a professional with experience cleaning and repairing structures damaged by contaminated water. If mold or mildew are growing beneath the floor, the conditions are far too damp. First step is to eliminate sources of moisture. Then mix about 3/4 cup of bleach with one gallon of water in a clean garden-style sprayer. Wearing old clothing and goggles or safety glasses (and a respirator if the conditions make one necessary), spray the framing with this bleach/water mixture. If you don’t wear a respirator, avoid breathing the spray. Following application, wipe off the mildew with a rag (or scrub with a brush, if necessary). Indoor wood surfaces covered with enamel or oil-resin paint rarely mildew, unless conditions are very favorable for mold growth. Softer paints on outdoor surfaces mildew more readily. Molds feed on the oil and minerals in the paint and cause a dirty-looking discoloration. They may penetrate the paint film deeply, even to the underlying wood. Mildew-resistant paints in all colors for outdoor wood surfaces are available at paint and hardware stores. Manufacturers have formulated their products with fungicides to help combat mildew attack. CAUTION: Mildew-resistant paints should not be used on window sills, playpens, beds, or toys because these paints can be injurious if they reach the mouths of small children. If mildew grows on wood, use heat and increase the air circulation to get wood as dry as possible. Badly infected wood may need to be replaced, preferably with wood that has been treated or that is naturally decay resistant. 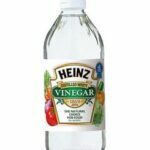 Thoroughly clean mildewed surfaces, woodwork, and other wooden parts by scrubbing them with mild alkali, such as washing soda or trisodium phosphate (8 to 10 tablespoons to a gallon of water), or with disinfectants. Paint and grocery stores and janitors’ supply houses sell these products under various trade names. Rinse the wood well with clear water, and allow the wood to dry thoroughly. Then apply a mildew-resistant paint. 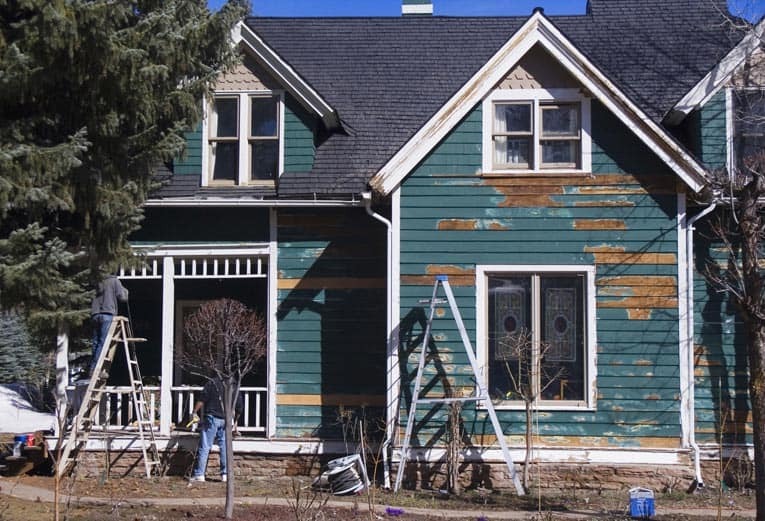 If the mold has grown under the paint or varnish, remove all the paint or varnish from the stained areas. Then scrub with a solution containing 8 to 10 tablespoons of trisodium phosphate and 1 cup of household chlorine bleach to a gallon of water. Stronger solutions can be used if necessary. Wear rubber gloves. If stain remains, apply oxalic acid (3 tablespoons to 1 pint of water). The acid is poisonous; handle carefully. Finally, rinse the surface thoroughly with clear water. Dry well before refinishing.